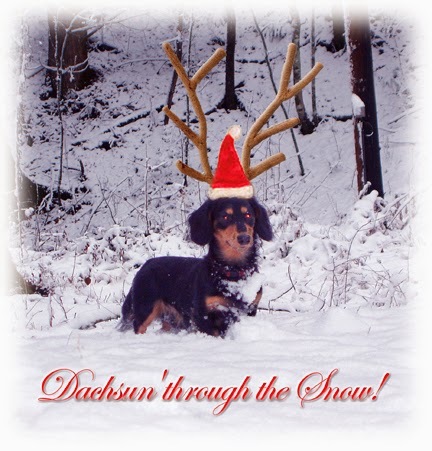 The "Hot Dog Blog" - Dachshund Breeder AKC Miniature Dachshund Puppies For Sale | Dachshund Hall: Yappy Dachshund Hall-i-days! It’s hard to believe we’re counting down the final days of 2013. We’ve been so fortunate to share our passion for the love of our little four-legged family members with so many of you this year. Welcome to the Dachshund Hall family! All of our recent litters are celebrating the holidays with their new families... watch out for all that shredded wrapping paper! We will be ending the year with the birth of a litter from Paisley & Boudro, due December 26th, see Dachshund Hall - Litter #1. Then we’ll begin the new year with the birth of a litter from Piper & Hubbell, due January 3rd, see Dachshund Hall - Litter #2. So, if you’re wanting to start the new year with a new puppy, we encourage you to contact us and get on our waiting list. Our puppies always find their new homes quickly.